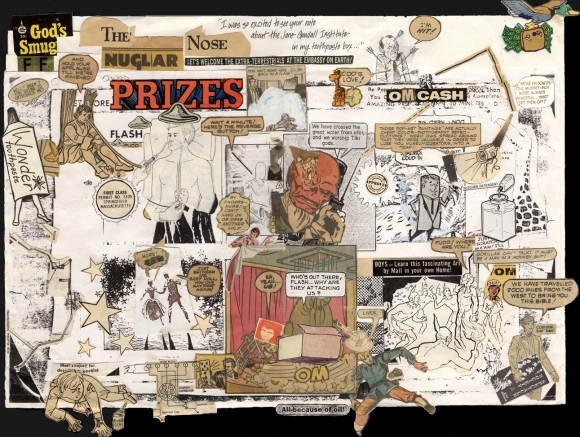 Flash Fudd is both the title and vague protagonist of a series of collage comic strips dating back to 1978 (though rooted in a series of comic collages dating to 1972) and continuing to the present day. A hybrid of Flash Gordon and Elmer Fudd, FF is most often depicted as a woman (though technically FF is 'differently gendered,' meaning whatever gender you think they are, it's the opposite). The collages derive from all manner of graphic narrative sources, from daily newspaper strips to pictographic directions for opening Japanese noodle packets, as well as virtually any other form of printed image and text. Although non-linear, they are intended as a form of narrative, and motifs recur across many years. New episodes are often constructed atop photocopies of older episodes, incorporating fragments of the earlier collage into the new one. The small FF’s have often been printed in small runs and distributed through the mail to random addresses or left in record stores, bus stations, phone booths, etc. The ongoing "They Approach the Cave" sequence, which includes God's Smug , reproduced to the left, is the most extensive group of FFs utilizing a single image, mostly built over the FF strip in which it originally appeared, Incredulous Metropolis (1978), perhaps the oldest extant FF strip. This series constituted my half of the two-person Hypotheosis exhibit of 2001. In 1984 and 85 I collaged and distributed a sequence of 5 folded, zine-like 4-page FF "comic books" that are somewhat self-contained. I returned to this format a couple more times, and most of these are included in the Flash Fudd - "The Comic Book" Gallery - they are not displaying in exact sequence, though, so please pay close attention to the numbering system in order to have the correct chronological viewing experience.